As new EPA Administrator Scott Pruitt announced plans to roll back his agency’s influence on energy and pollution regulations, and President Trump intimated his intention to cut a number of federal agencies’ budgets in 2017, achieving meaningful solutions on climate change appears dead on arrival in the near term. But actions taken overseas by nations as geographically and economically diverse as Germany, China, India, Chile and Mexico, among others, highlight a growing solidarity in moving forward on clean energy initiatives—a blueprint many U.S. governors, congressmen and voters wish the federal government would emulate. In the recent months since Trump’s election victory, state governments have shown a remarkable desire to push progressive renewable energy policies in spite of the new administration’s seemingly volatile stance toward non-fossil fuel energy sources. Such comradery is cutting across party lines as well, with red-state governors eager to bring new jobs and tax revenues to their constituents lest they miss out on the swelling clean energy boom. These efforts come at a time when new research in The Anthropocene Review indicates humans are changing the climate 170 times more quickly than nature itself, forcing global temperatures and sea levels to rise faster than originally predicted. Under the shadow of this bleak assessment, the incentive to take large steps toward true energy independence has not been lost on the majority of Americans. On Feb. 27, 2017, President Trump announced plans to slash the EPA’s budget by 24 percent, seriously hampering the agency’s ability to execute effectively as an institution tasked with overseeing environmental and energy policy. A few weeks prior, a group of 20 governors (12 Dem, 8 Rep) sent Trump’s office a letter advocating for strong government support for a number of renewable energy initiatives such as further research and development, grid modernization, offshore wind farms and robust development of battery, storage and distribution technology. The Governors’ Wind & Solar Energy Coalition holds considerable clout due to its bipartisan collection of successes already seen across the United States. Discouraging Trump from following through on gutting the EPA may be a tall order, though. The coalition is chaired and vice-chaired by Rhode Island’s Democratic Governor, Gina Raimondo, and Kansas’ Republican Governor, Sam Brownback, and is soliciting further support from all 50 states in the union. Red states like Illinois, Michigan and Ohio have already passed and began implementing renewable energy policies that would incentivize creation of clean jobs and set defined energy efficiency goals. Because the widespread benefits of ramping up renewable energy production affect every single state (and voter), traditionally conservative governors are setting aside some of their previously held beliefs on climate change in an effort to carve out their own success stories in reshoring American jobs to their respective states. These jobs are both white and blue collar, ranging from manufacturing solar batteries and installing panels and turbines to researching new technologies and bargaining for greater control of utility rates, in addition to the many ancillary positions needed under a new energy landscape (sales, retail/commercial marketing and customer service and maintenance). In Kansas, for instance, 30 percent of the state’s electricity comes from wind power, which supports roughly 6,000 jobs. Despite Kansas being a deeply conservative state, Governor Brownback is now advocating for even more tax subsidies and beneficial regulations that would help his state’s energy grid continue to churn out clean power and create more jobs, a position that just a few years ago would’ve been viewed as the complete antithesis of conservative ideology. Creating a new conservative paradigm on renewable energy may not be as difficult as it seems. The solar market expanded by 95 percent in 2016, making it a surefire business generator regardless of opinions on the size or role of the government. Governors are realizing this more and more, and are adjusting their policy positions to conform to this new reality. A prominent example of this transformation is in the number of states that have adopted renewable portfolio standards (RPS). Twenty-nine states and the District of Columbia have written into law the minimum amount of electricity generation and usage that must come from renewable energy sources. These RPSs are benchmarked to increase over time, gradually transitioning state energy usage away from fossil fuels. The majority of RPS requirements hinge upon wind power. Some states are going even further. A state senator recently introduced a bill that would propel California toward a 100 percent renewable energy portfolio by 2045. California’s current RPS mandates 33 percent of its electricity be sourced from renewables, a figure that is pegged to jump to 50 percent in 2025. Hawaii passed a similar portfolio target in 2015, and is also slated to run on 100 percent renewable energy by 2045. The Maryland legislature actually overrode Governor Larry Hogan’s veto on its state’s RPS, putting into effect a 25 percent renewable energy minimum by 2020, showing just how persistent state assemblies are in taking action as well. Converting the U.S.’s grid toward clean energy will be one long journey; however, states are uniting in their mission to not only pursue renewable energy policies but to stem the loss of jobs to overseas companies. As noted by the National Resources Defense Council, the largest solar manufacturers are Chinese. Wind power is nearly ubiquitous in Europe. 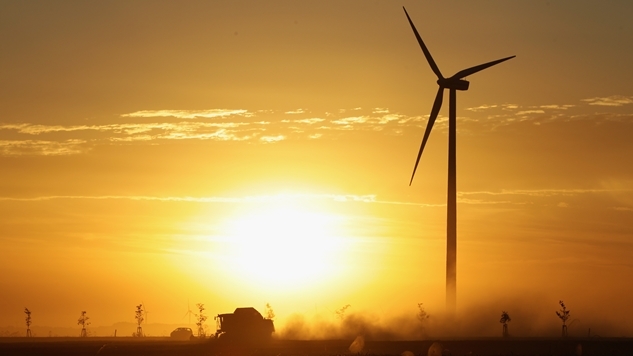 Latin America is making quick work of its move toward renewables as well. Every day that foreign nations expand their renewable footprint is a day the U.S. potentially loses current and future jobs, and it is state governors who will be the first to have to answer to their constituents on why they allowed well-paid jobs to leave their states. Conservative proponents of renewable energy are finding success in pitching their ideas not as steps to combat climate change (which is still a politically charged term), but as methods for energy savings, job creation and national security. Within this mindset, it’s much easier to garner support while reaching across the aisle in agreement with progressives. And while it’s still very uncertain just how much change governors from both parties will be able to enact without federal support, their unity is still a promising reminder of how collective action at the state level has the potential to effectively shift public consensus on the most critical policy issues of our time.